The European Survey Research Association was established in 2008 to provide coordination in the field of survey research in Europe and to foster and enhance links between European survey researchers and their colleagues in other parts of the world. The core mission of ESRA is, therefore, to encourage communication and interaction between researchers with the ultimate objective of improving the quality of survey research and encouraging its appropriate use in academic, policy, and commercial research. 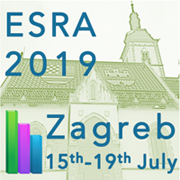 ESRA's main activities are organising a biennial conference on survey research and publishing the journal Survey Research Methods. The Association welcomes researchers who are interested in the methodology and substantive application of surveys from all disciplines and from across the academic, government, private and voluntary sectors.